Cherrapeno: Parkin for Bonfire Night! Hope everyone in the UK enjoyes the fireworks tonight or at the weekend, and stay safe if you are having your own fireworks party! 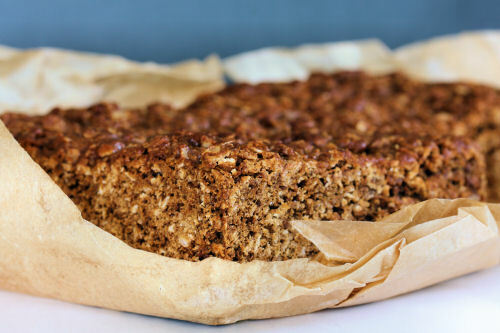 Parkin is a soft cake that is traditionally made using oats and treacle and is eaten on Bonfire Night. It originates from the north of England and can vary from being soft and sticky, to a drier type in texture. If you can't get black treacle, you can substitute molasses. I perked mine up with some crystallized ginger. You need to make the cake at least 5 days in advance, so that the flavours can develop. Recipe adapted from The Foody, this cake was the drier type of parkin. Pre-heat oven to 170°C/325°F/Gas 3. Line a 20cm/8" square baking tin with baking parchment. Measure the black treacle, golden syrup and the unsalted butter into a large saucepan and heat gently until the butter has melted, or you can do this in the microwave if you prefer. In a large bowl, mix together the flour, oats, sugar, ground ginger, crystallized ginger, cinnamon (if using), the bicarbonate of soda and a pinch of salt. Make a well in the centre and pour in the warm treacle mixture. Mix together using a spoon, add the beaten egg and mix thoroughly again. 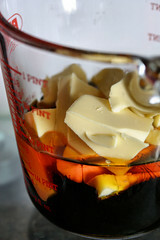 Pour the mixture into the prepared tin and bake for between 45-60 minutes, or until a cake tester or knife comes out clean. Allow to cool in the tin for 15 minutes before removing and placing on a wire rack. When the cake is cold, wrap in baking parchment and keep in an airtight container for at least 5 days before serving. Oh I love this Nic, especially the last pic. Now got to think of substitutes for the treacle and golden syrup. Great way to celebrate British Food! nipitinthebud - thanks! It's a good winter cake! Deeba - Do you have molasses and corn syrup? They would do. Grace - ha, ha, best stick clear of this one! Oats and treacle sound wonderful together!! The ginger adds a nice flavor too, I bet! 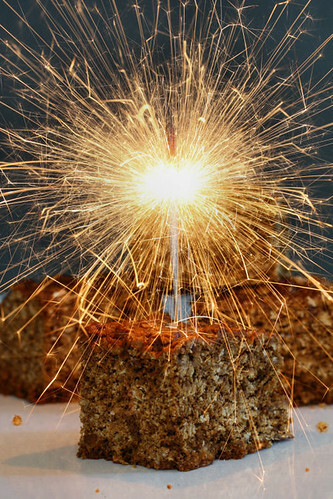 Thanks for this georgous recipe & now I know more about Bonfire night! I've never tried parkin, but, by looking at the ingredients, I'm sure I'll love it. No treacle:-( Molasses and corn syrup I've got . I must give this a try. Is the cake refrigerated during the 5 days or left out? I have never heard of Bonfire Night but it sounds like a festive holiday! That is a seriously cool photo with the sparkler! I've heard of parkin before but never really sat down and looked at the ingredients...sounds RIGHT up my alley. Enjoy the fireworks! Wow it looks fabulous! I love your first pic with the sparkler, it just captures the theme perfectly. petite nyonya - oh yes, ginger always adds a lovely flavour! Sophie - you will have to pop over one year and watch the fireworks! Sunita - yes thanks, and hope you did too! WizzyTheStick - well it's quite cool here at this time of year so I leave it on a workbench in the utility room, well wrapped of course. Venus ~ Vi - yes, very festive in the UK!